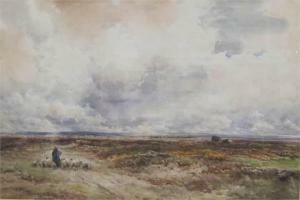 Find artworks, auction results, sale prices and pictures of Claude Hayes at auctions worldwide. 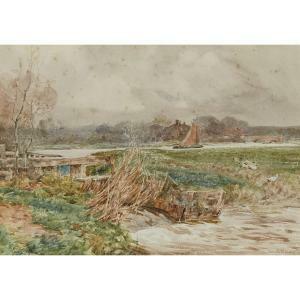 Claud Hayes, 1852-1922, 'A Shepherd and his flock near Weybridge', watercolour, signed and inscribed. 34 cm x 50 cm Exhibited: London Sketch Club 1904 with original 1904 Club ticket verso, priced 15 guineas. 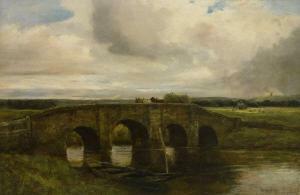 Provenance: Ex Collection of Mr and Mrs Pattinson, Calthwaite Hall, Cumbria. 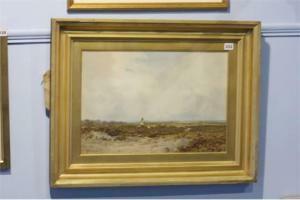 Sold with previous sale catalogue. 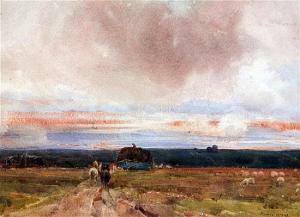 Image with the sunset in good clean condition with good strength of colour, in a washline mount and modern gilt frame, typed label verso, the other work in signifcantly poorer condition with discolouration of the ground paper and even scattered light foxing, also no doubt some fading although ground colours are still fair, both are signed in ink. Second picture in a modern card mount and slim gilt frame, artist details attached verso.